- Filmmaker Magazine this week published an interview I conducted with Peter Broderick at Sundance this year, talking about new approaches to indie film distribution. (You can tell I have the usual Park-City-in-January cold.) I'm planning to post the full 30-minute interview here soon. This video is part of a series I'm doing on the future of entertainment, underwritten by the nice folks at Akamai. The idea was to take some of the topics we discussed at The Conversation last fall in Berkeley and make them more accessible to people anywhere in the world. I invite you to embed the video wherever you like, link to it, or comment on it. The Future of Indie Film Distribution: Peter Broderick from Scott Kirsner on Vimeo. This video, of course, is also a nice little appetizer for the Distribution U. workshop Peter and I are doing next Saturday, November 7th, at USC. In the first six months of 2009, revenue from disc sales declined 13.5 percent, to $5.4 billion, according to Mr. Morris’s evaluation of Digital Entertainment Group data. A $200 million uptick in Blu-ray sales partly offset a $1 billion decline in DVD sales. Over all, home video revenue declined just 4 percent, helped by a spike in rental revenue. That bleak picture has studios now openly discussing what they have known privately for a long time: DVDs will continue to play a role, but it may be a supporting one to digital. Three Cool Ideas: Streaming from the Set, OpenIndie, and "14 Islands"
I hear about way too much cool stuff via e-mail, and am constantly feeling guilty that I don't / can't blog about more of it. So, if you are doing cool stuff (whether or not you have been letting me know about it), please keep it up! You're awesome. In what we think is a world first, the production company will provide all-day live stream from the shoot in Hervey Bay on November 4th. Viewers will be able to see [director] Andrew [Traucki] and the cast in action (and probably in the water) as a video crew follows him around on the day. It's live coverage and a making-of rolled into one, featuring interviews with cast and crew as the action unfolds. Viewers will be able to ask questions in real-time. Simon tells me via e-mail that he "will be be going to location for the stream, doing some camera work and editing. In typical Australian style, everyone on the team does whatever is required!" The 14 Islands Film Challenge (http://14islandsfilmchallenge.co.uk/) is an initiative to find 14 of the best young filmmakers in the UK - to send to the 14 islands of The Bahamas, where each director will create a movie of any genre, on their own island with the help of a local team. They will be there for 14 days and once they return there will be a BAFTA red carpet screening where a grand high winner will be selected by public vote and a panel of judges to win, yes, £14,000! The panels and presentations are often too short (and sometimes too superficial) to really make much of a dent. Ask the audience at the end whether they're feeling more confident and in control of their destiny, or more anxious and confused, and they're likely to say the latter. I've been talking for the last couple months with Peter Broderick about taking a different approach. We wanted to create a full-day workshop that'd dive into some of the marketing and audience-building strategies I explore in Fans, Friends & Followers, and would get into the nitty gritty of distribution and savvy deal-making, which Peter works on every day with his clients. We also wanted to bring in some guest filmmakers to talk in detail about how they've gotten attention for their work -- and made money from it. Finally, we wanted to make this a great opportunity to meet other filmmakers and writers and producers who're working on this "bleeding edge" of new marketing and distribution strategy -- to create lunch discussion groups around topics you're interested in -- and, if you'd like, to get some ideas from Peter, me, and the rest of the group about actual, tactical things you might do with your film, online and off. We're calling it "Distribution U.: A One-Day Crash Course on the New Rules of Marketing and Distribution." We're doing it on Saturday, November 7th in LA, on the campus of USC. If you register before noon on October 18th, you can take advantage of the early bird discount. Our goal is to cram in as many examples, case studies, data points, and proven strategies into eight hours as is humanly possible. The complete schedule is here. Right now, we're planning on doing this just once. Hope you can make it, and if not, perhaps you'll spread the word to friends who are in LA. I worked on a piece for Variety this week that intended to examine why no online destination has emerged specifically to serve up independent films. A decade after the dot-com boom, when the Web promised to make any piece of content globally accessible to any interested viewer, a dominant online destination for indie film has failed to emerge -- though many have tried. Earlier this year, San Francisco-based Caachi quietly shut down, and world cinema purveyor Jaman let go most of its staff. Two of the first sites to try to connect cinephiles with streaming and downloadable indie films, GreenCine and Intertainer, have since exited that business. As usual, there was a lot of material that didn't fit into the piece... and Snagfilms CEO Rick Allen e-mailed to take issue with some of the data I presented. - Gary Hustwit told me his last doc, 'Helvetica,' has already broken into six-figures of iTunes earnings. He says his new film, 'Objectified,' is now available for pre-order on iTunes, and it's already in the iTunes top ten list for documentaries. 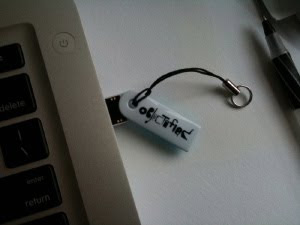 Hustwit is also selling a USB drive containing the movie (pictured above). They're $75 each, and they've been produced in a limited edition of 500. Hustwit says they're selling briskly. - Cory McAbee told me that a deluxe package of 'Stingray Sam' goodies is selling well through his site: for $49, you get a DVD, t-shirt, photobook, soundtrack CD, and two digital downloads (HD and standard definition). - Rick Allen, CEO of doc-streaming network Snagfilms, takes issue with the traffic figures I cited in the story, supplied by Compete.com. Compete says the Snagfilms site gets about 100,000 unique visitors a month, compared to about six million for Hulu. Allen accurately points out that some of Hulu's most popular full-length films actually come from Snag (like 'The Future of Food' and 'Super-Size Me.') And he argues that a lot of Snagfilms content is viewed on other site, describing Snag as "a massively sub-distributed network." Unfortunately, Snag doesn't share any data of its own about how often films are viewed on its site or others, so reporters like me have no choice but to cite statistics from independent third parties like Compete or Quantcast. - An interesting quote from Eric Lemasters, who handles digital distribution for E1 Entertainment: "iTunes and Netflix are probably leading the pack, but there’s a huge middle of the pack. Hulu is doing well, as is EZTakes. There's Amazon, Blockbuster [Movielink], CinemaNow. They all seem to be holding their own. EZTakes has done the best in that world. Snag and Jaman aren’t moving the needle much." Lemasters says 'Welcome to Macintosh' and 'The Bridge,' both docs, have been doing especially well on iTunes. - Steve Harnsberger of Jaman says that site has no plans to shut down, but they're focusing more on providing "white label" video delivery services for other customers, like content owners, electronics manufacturers, and potentially telcos. "The Jaman site is definitely here to stay," he says. "It's a demonstration site for our technology." - Distribution consultant Adam Chapnick of Distribber: "You have to be reminded that people like studio movies more. The reason that 90 percent of revenues online goes to studios is because most people don’t like indie movies." One reason that indie-only Web sites haven't succeeded, he believes, is that "most people don’t say, 'I’m in the mood for an independent film tonight.' They want a destination where all film can be aggregated." - Some data points from Chapnick: "I know of one film property that's been making $50k/ month on iTunes, but it's not a feature, it's a stand-up comedy offering. I'm told by Netflix that they pay up to 30k for their [streaming] rights; of course that means they probably pay at least twice that to a really worthy title. "But my bet is that 90 percent of indie films sell under 1000 units on iTunes, and 90 percent of indie films on Netflix are paid under $2500 for a year of [streaming] rights..."
Per-title agreement [for two years] with Netflix can go up to 5k-20k, especially if we give them a 60 day pre-dvd release window, and we have. Per-title revenue on iTunes for one year has proven to range greatly, from $ 50 to about $ 2000 with the average well below $1k thus far, but they have only been offering indies for just over a year so let's allow them to continue to build steam.